I’m just back from the Northern Ohio Regional SCBWI Conference, and my brain is teeming with ideas, so much so, that I feel I need the morning to decompress before diving back into writing my middle grade novel. While reviewing notes from the conference this morning, I’m thinking a lot about Newbery-winning author Linda Sue Park’s inspiring opening address, in which she discussed Joseph Campbell’s belief that there are really only two story lines: Hero Goes on a Journey and Stranger Comes to Town. Ms. Park asked attendees to raise their hands if the idea of only two story lines was an exciting prospect, or a limiting one. If you write for kids and haven’t been to an SCBWI conference, you should go! 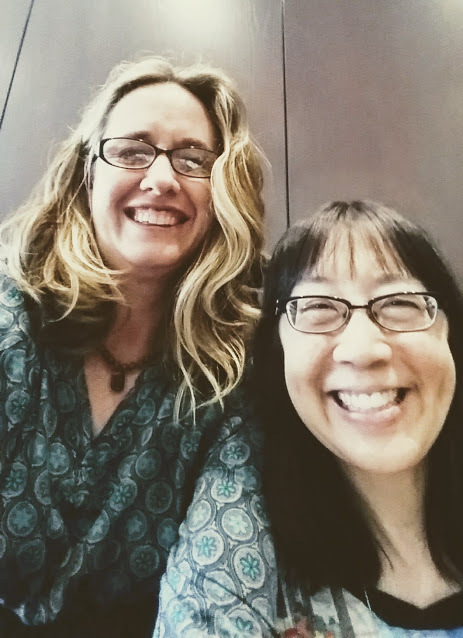 I had the pleasure of meeting the incredible author/illustrator Debbie Ridpath Ohi! What a difference a few years, and novel drafts, make! Years ago, I would have felt terribly constrained by the idea that my plot would fit so neatly into one of two categories. I blame grad school for this. Sorry. I got a huge amount of wonderful lessons, and lifelong friends, from grad school, but “plot” was a dirty word in my program. We not only didn’t study it, we looked down on it, writing short story after short story where very little happened and endings were left completely ambiguous. “Plot” was the stuff of “commercial” fiction and none of us wanted to be labeled something as crass as a commercial writer. Fast forward years later when my first adult novel fell flat because of plot issues, specifically a complete lack of pacing. Agents and editors loved the writing, but they needed story, and the ability to tell story was something that I’d either never really grasped, or had lost during the years I studied all the other important aspects of writing. If I truly wanted to write a novel that would reach an audience, I decided I had to learn how to create an engaging plot. I read a lot of books on the topic, for both writers of adult and children’s fiction. My favorite is: “Writing Irresistible Kidlit” by Mary Kole. My copy of that book is thoroughly highlighted and dog-eared. The other thing I did was tear favorite books apart to see how they worked. I took my favorite middle grade novels and outlined them. I studied those outlines against the rules laid out in Kole’s book. I saw the patterns, and with that, finally, I started to see my own way forward as I committed myself to an idea for a middle grade novel. For years, as I wrote a couple of adult literary novels, I had this romantic idea that I would just “follow my muse” and see where the book ended up. I used to have a quote in my email signature from E.L. Doctorow: “Writing is like driving a car at night. You can only see as far as your headlights, but you can make the whole trip that way.” In retrospect, this was a terrible idea for me and my creative work. I’m a planner, not a pants-er. I’ve learned the hard way that writing a novel with no plan makes for terribly headache-inducing revision. I would much rather take a lot of time, upfront, to plan out a novel, and have the end product be in pretty decent shape. Of course, I’m willing to veer off from my outline, but having that plan makes me so much more confident, and much less likely to procrastinate. When I sit down to start my writing for the day, I can look at my outline and know what scene is next. And, oh, it’s so much easier to put in little nuggets of information that will become important later…when I know what’s going to happen later! I wish I had learned these lessons earlier, but I’m so glad I did learn them. Writing is always an act of discovery, but when you realize all stories basically follow a similar pattern, and when you set up your book to take advantage of that knowledge, you are freeing yourself to simply play around with the details of your universal story. My middle grade in progress is definitely a Stranger Comes to Town book. More details to come! Better late than never! Sounds like a great conference. It was! SCBWI is a truly wonderful group.